PhotoBlogging from Kuwait for 365 days with 1 picture for every day. I went to Al Ghanim Electronics tonight to get myself a printer and scanner. On the way back I passed by some dvd street hawkers. 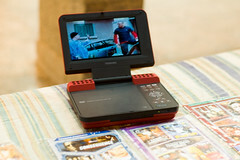 One of them I noticed last time had a portable Toshiba DVD player with a built in LCD screen. I thought that was incredible and tonight I decided I would take a picture of it and share it with everyone. So I went up to the street hawker and I was thinking, should I pretend I am a tourist or just speak arabic to him. I figured let me just speak arabic since it would be much easier. So I asked the guy, can I take a picture of your DVD player. He was like yeah go ahead, but then he froze for a second. He was like, first tell me what do you do. I told him I am a designer. He was like you sure you don't work for the municipality?? I told him do I look like I do? He was like no. So I proceeded to take the picture, then he again stopped me and told me, listen, if you work for the municipality you have to tell me, if it turns out you do then I am gonna be very disappointed. I told him relax, I just find the DVD player interesting. So I took the camera and was getting ready to shoot when I noticed the guy moved completely away from his table. I guess he was worried he might be in the picture. I took my shot, thanked him and walked away. so do you work for the municipality ? A picture a day, everyday, for 1 year. Project started on my wedding night, Nov 14th 2004. The aim of the project is to learn more about Kuwait and increase my creativty. Project will end on Nov 14th 2005. I carry my Nikon D70 digital camera with me always. I use a Nikon 50mm 1.8F AF lens. I blog from my Apple G4 Powermac. Miskan is a Kuwaiti island that lies to the south of the Bubiyan Island. Miskan is void of any vital activity except for a lighthouse to guide ships sailing in the Gulf night. I am a Lebanese living in Kuwait. I am a Junior Art Director at a local advertising agency. I previously worked on Qhate and Moblogging from Kuwait. I currently also have a blog I run with my wife called 2:48AM [The B-Sides].